This shell script will build and install the Python scientific stack, including Numpy, Scipy, Matplotlib, IPython, Pandas, Statsmodels, Scikit-Learn, and PyMC for OS X 10.10 (Yosemite) using the Homebrew package manager and pip. The script will use recent development code from each package, which means that though some bugs may be fixed and features added, they also may be more unstable than the official releases. 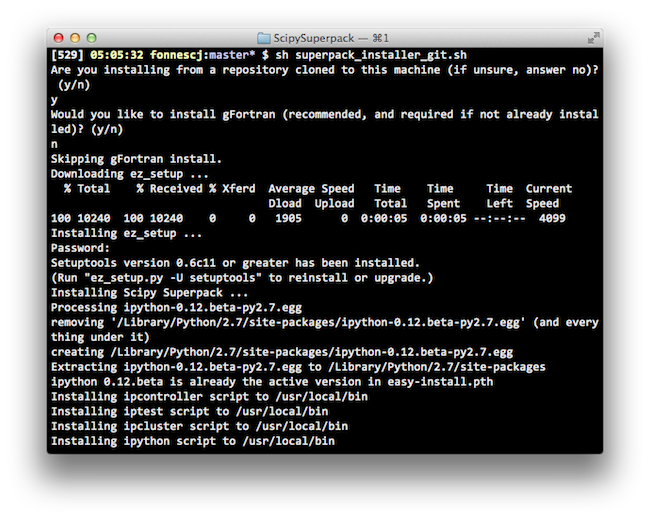 The SuperPack will install Python 2.7 or 3.4 from Homebrew and build all packages against it. If you have not already installed the current Homebrew, Git, and the Xcode command line tools, these will be installed for you. Contact Chris Fonnesbeck or follow me on Twitter.